I am a girl stuck in the 80's. Sometimes I find myself singing random 80's Hairband songs. Trying out this drink brought this song to my head immediately. Of course I know the song isn't really about cherry pies, but the song is catching as hell! When I was growing up in Pennsylvania, we had a cherry tree and I used to love going down to pick cherries. Those cherries never made it into the house. I do remember that! 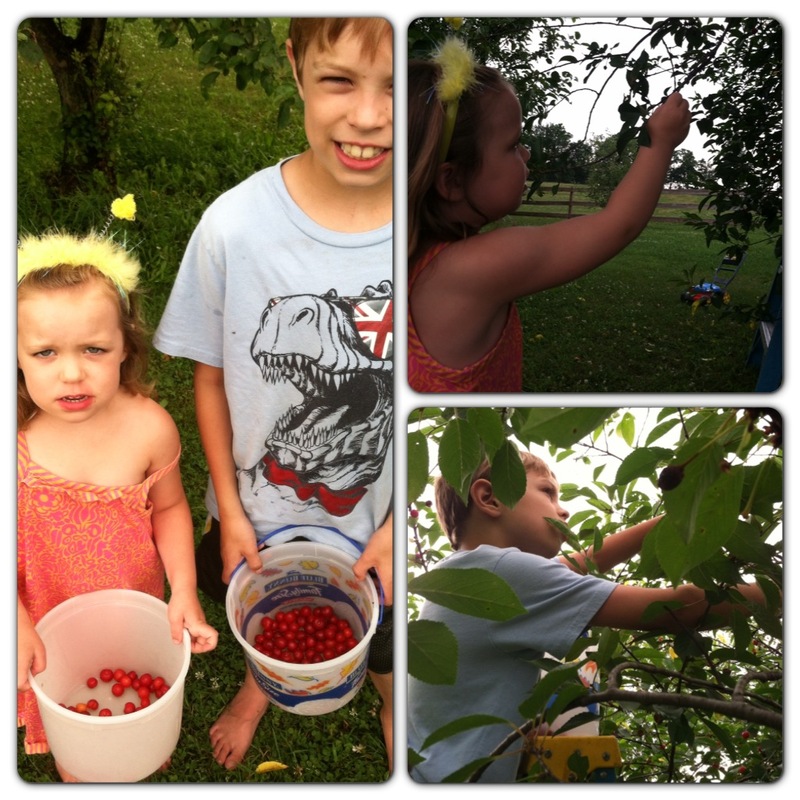 Now when we visit family in Pennsylvania, my kids enjoy heading over to the cherry tree and picking cherries. They haven't fallen in love with the cherries, yet. But I know in time, they will love them! So when Cheribundi sent me a sampler case of their tart cherry juices, I was quite excited! In my sampler case I had - Relax, Restore, Rebuild, Light and Original flavors. To learn about the ingredients and vitamins - please visit Cheribundi's Our Juices page. At first I was blown away by the flavor. I really enjoy cherries, especially tart ones. So drinking them was even better. I must add, most of the time, I do not like to drink calories. I usually save those calories for the occasional margarita or beer, but when it comes to a drink that promises recovery, improved health and improved sleep, I'll definitely choose some calories. - Studies have proven tart cherry juice blocks inflammation-causing enzymes which reduce pain felt within the body. Because of this, tart cherry juice is often used by many athletes after strenuous workouts for fast muscle and joint recovery. - Tart cherry juice has been shown to encourage melatonin production and which allows you to sleep more peacefully, naturally. Now that I have happily tried out all of my Cheribundi samples (I even shared some with the family), I must report that I did noticed that I slept far better than I have in a long time. I take a melatonin supplement because I have trouble falling asleep and falling back asleep after being woken up in the middle of the night (kids), but during my Cheribundi challenge, I didn't take the melatonin and noticed an improved difference. Also, I did try Cheribundi after my May marathon. I was quite sore afterwards, and continue to be rather sore. During the time I was trying Cheribundi, I definitely experience less pain. The difference was so much, that I just went to the grocery store and bought more Cheribundi juice because the pain in my foot is back! Cheribundi is also hosting a cool 7-day Challenge on their facebook page. You can go there and sign up to get coupons to start out the challenge if you are interested!!! 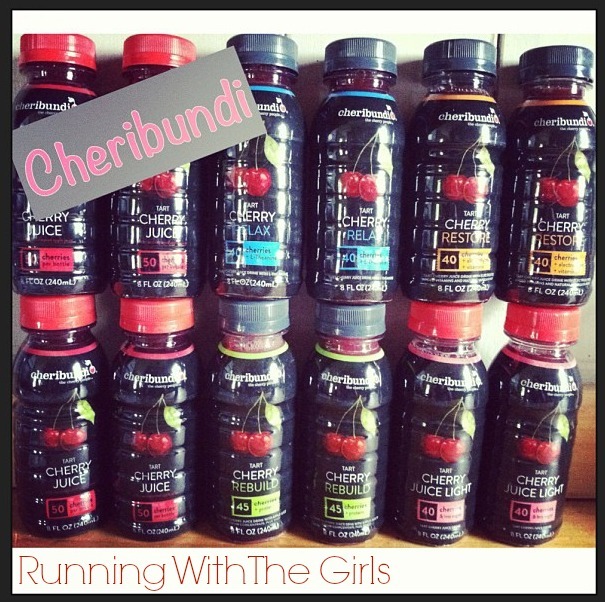 The incredible people at Cheribundi have offered one of my readers a sampler pack of tart cherry juice. I'm going to keep it pretty simple to enter. Tell me in a comment why you want to try Cheribundi and what flavor you would like the most. Share this giveaway via twitter, facebook or on your blog and leave me a comment with the link. 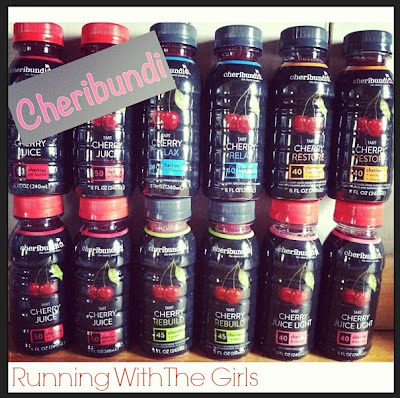 A sample tweet could be "I want to win a sample pack of @cheribundi from @runningwtg http://www.runningwiththegirls.com/2013/06/ad-cheribundi-shes-my-cherry-pie.html "
You have 5 possible chances to win this delicious juice with it's amazing properties. The giveaway will end on July 5th. I'll post a winner on July 6. The giveaway is only open to those living in the continental US. Disclaimer: I was provided a sampler case of Cheribundi in exchange for a review/giveaway. I was not obligated to post a positive review. As always, all opinions expressed on my blog are 100% my own. I want to try the restore kind. I love all Cheribundi but mostly like the tart cherry flavor. And I would like to try the tart cherry light. Like you said, I like to save my beverage calories for margaritas! I'm a follower on Google Friend Connect (I don't use Bloglovin' much)... hopefully I can add you to Feedly after the big Google Reader meltdown on Monday. I think the Restore formula would be best for me... I dig those extra vitamins. It's weird, I don't like too many fruit flavours, but cherry is one of the exceptions to that rule, so maybe Cherry juice is the way to go! And now I have Cherry Pie stuck in my head, thanks. I see your Cherry Pie, and raise you an Unskinny Bop. I think the restore, rebuild, and relax all sound amazing! I've tried Cheribundi before but want to try out this new line! Would love to try Rebuild for muscle strength! Following you on Twitter and I tweeted your link via @serene_streams! I followed your blog on BlogReader. I want to try Cheribundi as my ortho surgeon recommended tart cherry juice as an anti-inflammatory choice over an anti-inflammatory drug (how often do surgeons do that?!?!). I have a permanent injury to my ankle and I'd love to see if the tart cherry juice lite would help. Also did a tweet @lcblandford and posted on my fb page. I would love to try the restore - love that it has the protein. And I've seen so many articles about the benefits of cherry juice. Relax for sure!! Any help sleeping!!! Would enjoy trying Rebuild for muscle strength after my gym workouts! Cherry Rebuild for more protein in my diet! I love cherry juice and really want to try this brand.